Modern day men and women are not the only ones who like to adorn their clothing with stunning colors and designs. In fact, for almost as long as humans have been wearing clothes they have chosen to decorate them with colorful and individualistic patterns. 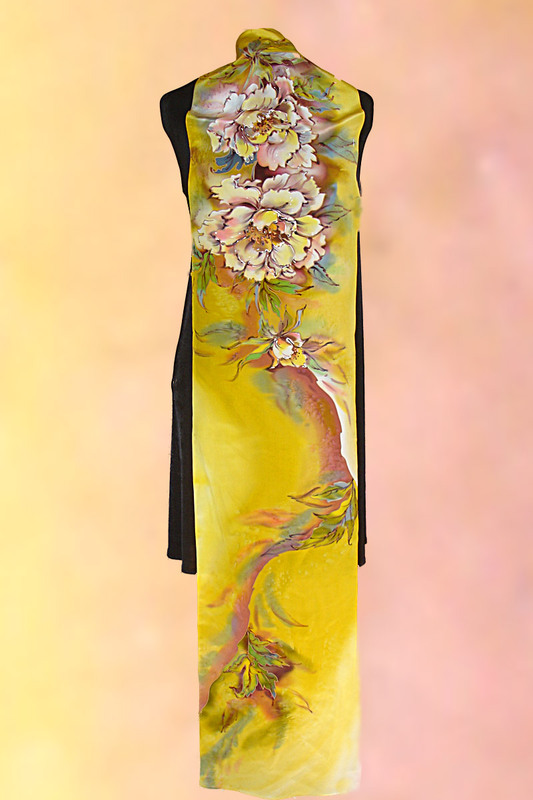 The beautiful art of painting on silk is a tradition which goes back for centuries, but even today there are still craftsmen and women who produce the most exquisite works of art using silk as their medium to create a whole range of clothing and accessories. Although different sources show different time lines for the earliest production of silk in China, the art of painting on silk can be traced back to the 2nd century AD. Since then, silk as a ‘canvas’ has been used for everything from portraits, paintings and wall hangings to all manner of home décor furnishings and, of course, the exquisite hand painted scarves which are still produced today in the time-honored fashion. Whilst the artists of yesteryear only had dyes made from plants at their disposal for creating their designs, of course nowadays artists and designers have a much wider range of special purpose coloring mediums to choose from. The paints and dyes which are used for coloring silk have developed much over the years, but it is the dyes which offer the ultimate in luxurious appeal. Whereas silk paints can be felt on the surface of the fabric, dyes become part of it, so that none of the natural softness of the material is lost. Of course, more recent times have seen printing processes become established which have made the coloring and patterning of all types of different fabrics easy and inexpensive. Even many of the silk items which can be found in stores today are mass-produced and printed with silk paints. The very finest examples of silk goods, however, are still those which use the traditional methods and are created by genuine artists using painstaking techniques. The production of women’s hand painted silk scarves is a long and time-consuming process which involves a number of steps. First of all the artist must create a unique design for each piece and then either create a template of the outline of the design or apply the outline directly to the tightly stretched silk fabric using wax to set boundaries for each color which is to be introduced into the material. Using a variety of painting techniques to create blocks of color, shading and other types of effect, the dyes are applied using a paintbrush to create these wearable works of art, and then the scarf is finished with a process of steaming to fix the color and remove the wax borders. Finally it is washed to remove any excess dye, with the remaining color able to withstand years of hand washing without fading. While modern technology most certainly has much to offer in many areas of life, sometimes there is simply no way to improve on traditional methods without interfering with the quality of the finished product. 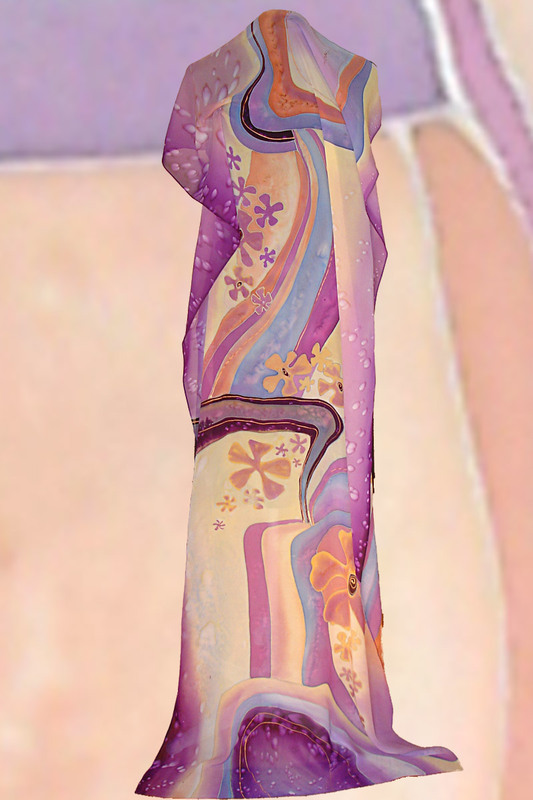 Today’s hand painted silk scarves, although very much modern day accessories which are loved by elegant women around the world, are still at their most exquisite when produced using ancient techniques. As time progresses styles and trends are set. Some last for decades while others are short lived and there’s no one there to throw a single rose. But as time changes the only thing that will remain the same is the hunger and the desire for fashion and its every changing mind in the world today. But what are these priceless fashion styles that they wish to hold on to or what is it in present day that is a must have now for teenagers of all ages. Today it’s all about the scarf. Men, women, teenagers of all ages and genders are wearing scarves. It has become the “it” accessory along with skinny jeans. The scarf is what draws the attention to the color and or the patterns within the outfit in general that allows the teenager to make his or her fashion statement. On television shows such as iCarly or well known teen idols like the Jonas brothers wear scarves that display their own sense of fashion. And for girls they venture off into different fabrics. Cloth fabrics with checkered patterns, strips, polka dots. Sometimes the fabric can be stripped or tied and let loose at the end to give it more flare. The colors can sometimes be flamboyantly red or yellow or turquoise. The scarf may only match the shoes or nothing at all but the point is to cast out your own individuality and let the trend be known. Not all trends are horrific, but can even excel and become even better. Women and even young girls have even taken to silk scarves which would be considered to fanciful or even wrong for the occasion which is not necessarily true. Silk scarves not only contribute to the artful trend but they also add a feminine aspect to it for those young women and women of all ages. It doesn’t have to be declared accessible for only the dinner party or prom or even a reception it can be for every day school. Not to mention it’s easy to find silk familiar fabric at local stores and to style and jazz it up however you wish. Silk can be painted and printed just as any other fabric with correct care precaution. Another fun fact about wearing silk today is that is light weight and easy to sling around. You can easily stash it in your book bag or purse when you feel it’s getting in the way. Silk is also used in the teen world because it evokes a sense of maturity and decency compared to a lot of other fabrics as seen on womenclothingtoday.com. The cloth types are seen to be fun and can be used as well. Although it’s an ever growing trend you can see the expression being brought out in each style teenagers are able to express it positively even if it’s short-lived. The scarves are the new “it” item silk is now in transition to make another difference in the growing teenage age. 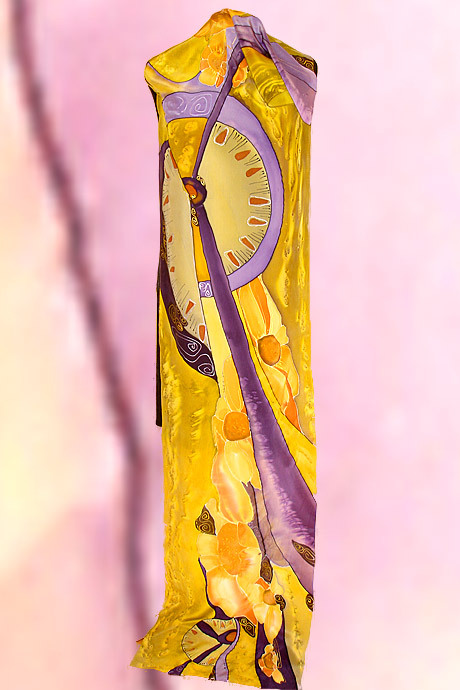 Hand-Painted Scarves – The Perfect Way To Express Your Individuality! Since time immemorial, humans have used different means of expressing their individuality. Even centuries ago, everything from unique pieces of jewelry and tattoos were used by people who were keen to express their personalities and demonstrate their social standing through their outward appearance, and things are not so very different all these years later. In modern times, we have a whole host of ways in which we declare to the world just who we are on the inside. Hair styles and colors, clothes, cosmetics, jewelry, piercings, tattoos and even our choice of car or the way that we decorate our home makes a statement about our unique identity. While some prefer to express themselves in more subtle ways, others really like to push the boundaries and create an entirely individual look which affects every aspect of their appearance. Women’s accessories have always been an extremely popular way to take an otherwise ordinary item, lift it out of the doldrums and make it entirely unique, and scarves have endured as one of the most popular. Hugely versatile, they offer endless opportunities to express who you are in as understated or flamboyant a way as you wish. Although most of the famous designers have included women’s silk scarves in their collections, many of the designs are neither totally unique nor hand-painted, despite their often exorbitant prices. In fact, in the majority of cases, rather than helping the wearer to stand out, they speak more of conformity as numbers of women all turn up to the same occasion wearing the same Burberry or Hermes scarf. Run-of-the-mill examples bought from a department store also do little in terms of expressing your uniquely individual style and taste. Colors, textures and designs that you find appealing rather than just trendy are all excellent for making a personal statement. With its luxurious feel and its intensely glamorous look, silk is simply the ultimate choice of natural material for a handmade scarf and makes the wearer both look and feel elegant. Cool in the summer and warm in the winter, it can be worn at any time of the year and for any occasion, thus making it great value for money. Although beautiful in its own right, when silk is combined with a hand painted or hand dyed design, the effect is one of utter exclusivity and class. Hand painted scarves are more than just a pretty design – they are a genuine piece of original art which, rather than merely being consigned to the walls can be used to adorn clothing, bags and hair and to customize otherwise plain or lackluster items. From bold colors to the subtlest of pastels, there are designs to suit every personality and the widest range of tastes and styles, and even the shape of the silk scarf can be selected to meet a specific need or preferred method of wearing. So, if you have had enough of following the pack and want to truly express your individuality, why not think about investing in the beauty of a unique hand-painted silk scarf? What better way to make your mark as someone with true sophistication and style!